Considering what it means for a thing to be digital, Catch | Bounce explores what it means for an artwork to exist independently from an artist or audience. 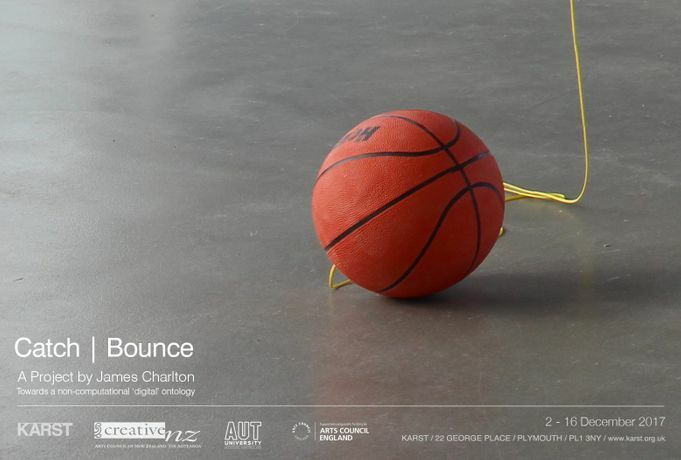 Catch | Bounce is a project by the New Zealand based multidisciplinary practitioner James Charlton. Considering what it means for a thing to be digital, Catch | Bounce explores what it means for an artwork to exist independently from an artist or audience. Straddling the line between interactive installation and conceptual art, Charlton exhibits the time between a catch and a bounce, the “transactional interval of a call and a return”. In opposition of post-Kantian metaphysics, Catch | Bounce asks us to consider the possibility of art in which human subjectivity is no longer a final guarantor. James Charlton’s recent projects includes Catch | Bounce at Exhibition Research Lab, Liverpool (2017); Waiting Event: 64 Bytes at The Post-Screen Festival, Lisbon (2014) and an ongoing collaborative exhibition with New Zealand musician and artist Philip Dadson: Body Tok Quintet at Colab, New Zealand (2012). He is currently Senior Lecturer and Programme Leader of Postgraduate Studies at Colab - Auckland University of Technology’s Interdisciplinary Unit.